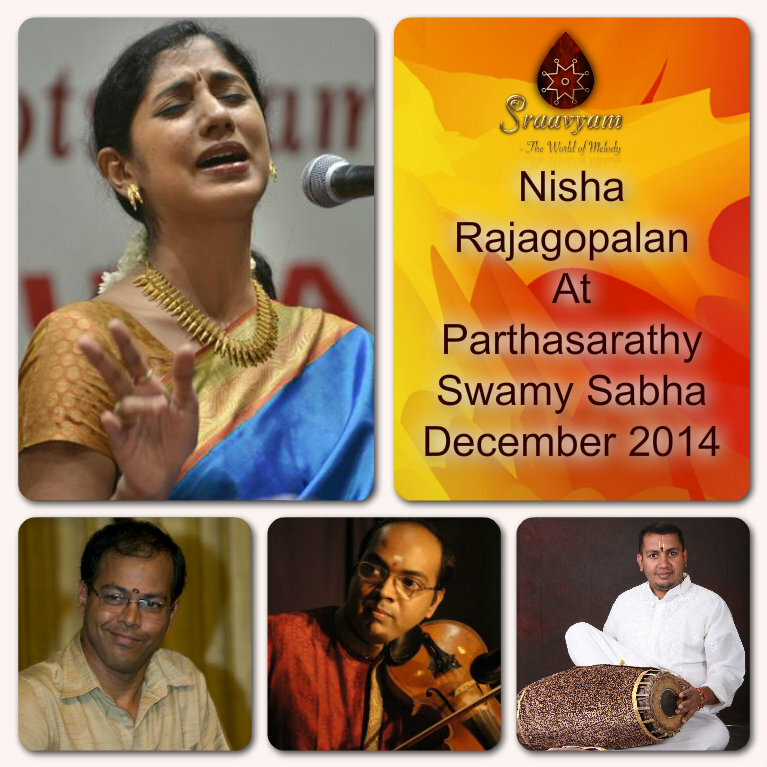 Nisha Rajagopalan, a popular young Carnatic vocalist, commenced her musical training with her mother, Smt. Vasundhra Rajagopal, while residing in Toronto, Canada. She had advanced training with Late Sangita Kala Acharya Shri T. R. Subramanyam after moving to India, and is currently training under Sangita Kala Acharya Shri P. S. Narayanaswamy and Sangita Kala Acharya Smt. Suguna Varadachari. She is an ‘A’ graded artist of the All India Radio and an accredited artist of Indian Council for Cultural Relations (ICCR). She has performed in all the major Sabhas in Chennai and all over India. Nisha has toured the US, Canada, UK, Singapore, Australia for performances. She has also participated in the Cleveland Thyagaraja Aradhana, USA. 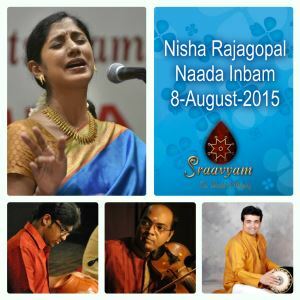 Nisha has provided live vocals for the theatre productions of Dr. Gowri Ramnarayan’s “JustUs Repertory” for 'Yashodhara' and ‘Sarpa Sutra’. She was invited as a faculty member / performer for Music India (conducted by Milapfest, UK), a week-long workshop at Liverpool, UK in July/Aug 2013. Nisha is the recipient of various prestigious awards such as Isai Peroli (Kartik Fine Arts), Kalki Krishnamurthy Memorial Award (Kalki Krishnamurthy Memorial Trust), Shanmukha Sangeetha Shiromani Award (Sri Shanmukhananda Fine Arts and Sangeetha Sabha), The Hindu Saregama M S Subbulakshmi Award (first ever recipient of the award) and Outstanding Lady Vocalist (The Music Academy).